Ryan’s speech comes as a potential government shutdown looms. Lawmakers are sparring over which programs should be funded. Republicans want a considerable increase in military spending while Democrats are insisting on equal increases for defense and non-defense programs. In his speech, Ryan accused Democratic leaders of “playing politics” with military lives by mingling a budget deal with issues such as immigration and domestic spending. 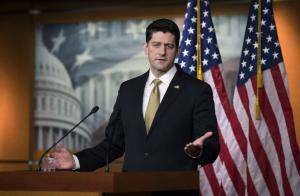 “Our military is being used as a bargaining chip for completely unrelated items,” Ryan said. He laid out his argument for military funding with reminders of threats posed by Islamic State fighters, North Korea, Russia and Iran. “If for any reason it shuts down the worst thing is what happens to our military,” Trump said.